Hitler's 'Mein Kampf' Is Back In German Bookstores After 70 Years : Parallels A new, annotated edition — complete with criticism — is the first publication of the notorious autobiography in Germany since the end of World War II. 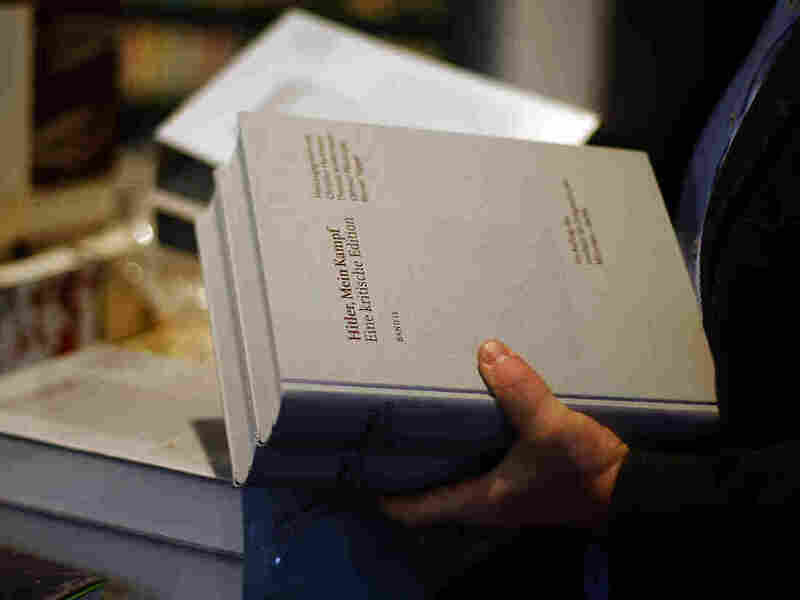 The new "critical edition" of Mein Kampf, shown here in a Munich bookstore on Friday, is the first version of Adolf Hitler's notorious manifesto to be published in Germany since the end of World War II. A reprint of Adolf Hitler's notorious autobiography, Mein Kampf, or "My Struggle," is for sale in German bookstores today for the first time in 70 years. The annotated edition is being published by the Munich-based Institute for Contemporary History, and its editors say the new version points out Hitler's lies and errors and includes critical commentary on how the original version, published in the 1920s, influenced Nazi atrocities. Given its muted unveiling in Berlin, it's hard to imagine the reprinted edition becoming a German best-seller, as it was during the Nazi era, when there were 12 million copies in print. By comparison, there are only a few thousand copies of the new edition. At Dussmann, the German capital's largest bookstore, there was only one copy of the annotated reprint for sale on Friday. It was tucked onto a shelf on the back wall of the top floor, mixed in with other books on Nazism. The store said any additional copies would have to be ordered online. That any German bookstore would carry even a single copy of Mein Kampf — even a reprint peppered with criticism — irks Ulrich Ripke, a 42-year-old teacher from Berlin. "It's simply rubbish," he says. Annotated reprints "should be done for books that are worth reading, and this one isn't worth reading." Another Dussmann customer, Karl-Sigurd Hesse, says he wouldn't buy a copy, either. The 64-year-old German transplant — he's originally from Madison, Wis. — says as a freedom of speech issue, he's OK with the manifesto being sold now that the ban on reprinting it has expired. The Bavarian government — which had been given the copyright by Allied forces in 1945, following World War II — had imposed the ban. "This is a really bad analogy, but book-burning is book-burning, whether you do it through a law or do it personally," Hesse says. His German wife, Sieglind, shoots him a worried glance. "We don't plan to read it, right?" she asks, after grabbing his hand. Hesse assures her they won't. In a statement Friday, World Jewish Congress President Ronald S. Lauder also dismissed the annotated reprint, saying Hitler's autobiography belongs "in the poison cabinet of history." "Mein Kampf should have been properly studied 90 years ago," Lauder said. "Hitler's lies should have been rebutted back then. Alas, we all know that because that didn't happen Hitler felt emboldened to embark on the biggest mass murder in the history of mankind." Magnus Brechtken, deputy director of the Munich institute publishing the annotated reprint, says people shouldn't be afraid of the new version. "It was never a forbidden book," he says. "It was only forbidden to reprint it in German." Even during the ban, Brechtken says, copies of Mein Kampf that survived the war were available in some German antique bookshops, which is where he found the edition that he used for his doctoral dissertation in the '80s. The text can even be found online, he says. "So what we are doing," he says, "is just giving anyone who is interested in Mein Kampf the necessary information to put this book into the correct historical context." And to correct the errors. For example, Hitler claimed in the book that he became an anti-Semite while he lived in Vienna between 1908 and 1913. But Brechtken says history shows the Fuehrer's hatred for Jews didn't develop until much later — while he was in post-World War I Munich. Another inaccuracy the reprint highlights is Hitler's claim that the government of the Weimar Republic mistreated disabled World War I veterans. Brechtken says it was the Nazis who actually killed thousands of those veterans years later. Mein Kampf is the only book from the Nazi era for which there had been no German annotated version, because of the ban. "And we are just filling this gap, so to speak, so there is [a] full overview on this historical text," he says. Josef Schuster, who heads the Jewish Central Council in Germany, says he plans to read the annotated reprint. He's read excerpts of Mein Kampf in the past. His father, who survived the Holocaust and moved to what was then Palestine, owned a copy. Schuster thinks it's unlikely the reprint will find a big following. "This version is no longer a right-wing publication," he says. "On the contrary, it's a book which shows what a botch job it is." But the German Jewish leader warns that far-right factions that already embrace anti-Semitic and anti-foreigner views may try and use it to promote their agendas. In short, Mein Kampf may have long been available, but reprints make it more accessible, Schuster says. That worries Jeremy Adler of King's College in London, too. In an interview aired Friday by German Public Radio, the British expert on German literature said: "In principle, I am against reintroducing seditious, racist texts and spreading them around." He said if the Munich institute wants to put out a critical edition of Mein Kampf, it should do so without the original text — rather than putting Hitler's hateful manifesto back in German bookstores.